The passing of any person always brings dismay, sadness and the sense of permanent loss. Hence, it is difficult if not impossible to avoid these sentiments when writing this tribute to a person like Jean de Vellis. For those of us who had the honor and privilege of knowing and working alongside him, Jean meant more than a simple professor, more than a creative scientist, more than an outstanding colleague, more than just another boss. Jean was a fatherly and wise man who forever touched the heart and enlightened the minds of uncountable people during his 60 years of work and service for the advancement of science and the formation of researchers. His scholars, colleagues, and friends will miss him deeply and we all share in the sadness of Jean’s wife Phyllis, and his children, Genevieve and Phillip. Meeting Jean was an adventure in itself. There was always the contrast between the quick smile of recognition and a twinkle in the eyes when you encountered him, and the thoughtful pause before addressing a difficult problem. With his characteristic demeanor, Jean would face any crisis with a rare mix of optimism, foresight and acceptance that life deals both good and bad hands. He would always remind us that it is up to ourselves to move forward in front of adversity. This pragmatic optimism in his conduct always felt natural, magnetic, iridescent. Jean had limitless faith in people, believing in our capacity to surpass the unsurpassable, and to constantly remake ourselves into something better, greater and more powerful. He would encourage, support, praise and believe in the potential of people, especially the young, and remarkably, those coming from dire socio-economic conditions. Jean’s energy was contagious and an endless reminder that we all have the seed in ourselves to bloom into beautiful flowers. Not surprisingly, Jean was an excellent and patient gardener. During his illustrious career, multiple societies, institutes, and boards, including the American Society for Neurochemistry, the International Society for Neurochemistry, the Winter Brain Conference, the Institute for Developmental Neuroscience and Aging, the Christopher Reeve Paralysis Research Foundation, and the Mental Retardation Research Committee of the NICHD enjoyed from Jean’s keen mind and expert advice. Jean was an editor for the Journal of Neuroscience Research (JNR) from 1980 and Editor-in-Chief from 1999 until 2015, remaining as Editor-emeritus until his death. JNR was more than a scientific publication for Jean, it was part of his family. As editor-in-chief of JNR, he was exceptionally supportive of multiple meetings such as the International Conference on Brain Energy Metabolism series and was a strong advocate of special issues dedicated to encompassing broad areas of brain function. 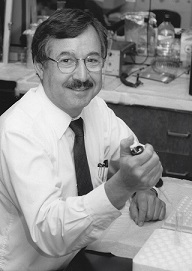 Jean was the Director of the Mental Retardation Research Center (now the Intellectual and Developmental Disabilities Research Center) at UCLA, where he worked since immigrating to the US in 1964. He held the George Tarjan Chair in Mental Retardation at UCLA and was a Distinguished Professor in Neurobiology since 2004. For decades, Jean and his colleagues shared successes and failures, both professionally and personally. Curiously partaking in the American dream and at the same time rooted to his French family and culture, he understood very well the global citizenship shared by all scientists. Jean often welcomed students from all around the world to work on their dissertations for one or two semesters. His laboratory was an example of a multicultural global environment, with postdocs from every continent. Being a creative and innovative neurochemist, Jean made seminal contributions, particularly to the field of oligodendroglial biology. He was the first to successfully develop the methods to obtain and culture primary oligodendrocytes and astrocytes from the brain. This technique, which provided investigators across the world with the revolutionizing capability to study oligodendrocytes, was the cornerstone of countless publications and it is still one of the most used approaches to culture glial cells in current research. In the lab, Jean was a warm, and engaging counsellor with so much enthusiasm for his research and that of others, and for studying all aspects of brain development and neurological disorders. He would be a strong and constant advocate for thinking outside of the box. Jean was generous to all, without distinction, and would always find the right way to help everyone succeed. So many of us have our paths and our lives shifted for better by Jean’s advice. So many of us are in his debt forever. Atop of his kind nature, was a gentleman who would always pay attention to details such as bringing double delights roses from his garden to the secretary office, or oranges and grapefruits to our lab meetings, cultivated by his own hands in a small parcel of land in Venice, Los Angeles. He fondly loved that place, which he once told me, reminded him of his childhood at the old family orangery farm near Carthage, in Tunisia. Jean was like a cool breeze bringing balsamic accords to the spirit at dawn of warm summer mornings. Although the sadness of losing Jean will never disappear, we owe it to him to stand up and stay in the race. He was a long-distance runner and he has now passed the baton of his legacy to us.